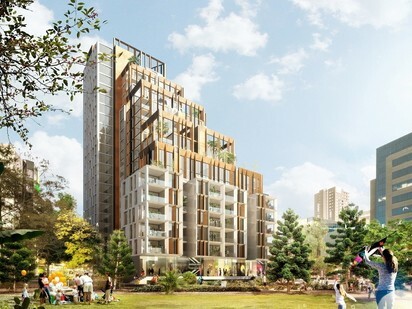 A 175-apartment development has received unanimous approval from the Sydney West Central Planning Panel (SWCPP) for the site of 5-7 Parkes Street in Parramatta. The slender, stepped design is a collaboration between Tony Caro Architecture, Aleksander Design Group and Order Architects, and will form part of the revitalisation of Parramatta’s southern gateway. “This competition-winning design was awarded design excellence by the design jury as it has excellent, regular apartment plans, good resolution of internal corner design, and efficient layouts. “It is comprised of slender tower forms capped by open, coloured frames, creating a silhouetted skyline, particularly when viewed from a distance. The design team was initially confronted with several challenges related to the site. The narrow, corner location was addressed by embracing the site’s proximity to the largest open space south of Parramatta Railway, Jubilee Park. Heavy traffic flow and associated accessibility issues were overcome by turning the design itself into a pedestrianised link between the mixed-use building, Jubilee Park and the adjacent public domain. SOLSTICE’s stepped design has been oriented to optimise solar access, and to provide maximum levels of light and air to the 175 apartments within. The unanimous approval for SOLSTICE follows a two-year investment in the planning process by the developer, Dyldam. Dyldam has already been recognised for reinvigorating key gateways throughout Parramatta CBD, including their Entrada development on the corner of Victoria Road and Church Street. “Dyldam is passionate about re-energising the streetscapes of Parramatta to reflect the sophistication and economic significance of the city. Dyldam will translate the winning design into reality, creating a valuable social asset for the wider Parramatta community,” says Dyldam’s managing director, Sam Fayad.